Two packets each of four different flavored varieties. 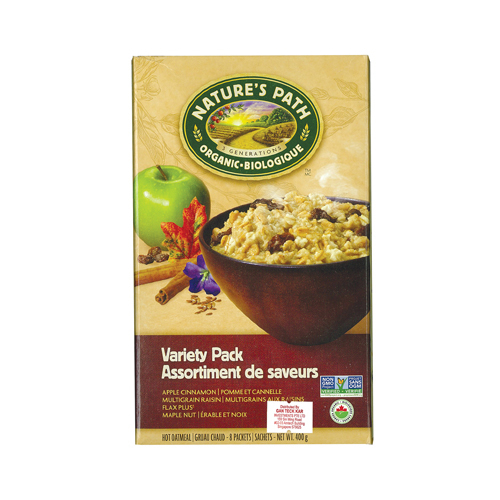 Apple Cinnamon Hot Oatmeal: Ingredients: Organic rolled oats, organic evaporated cane juice, organic dried apple, organic cinnamon, sea salt, natural apple flavor. 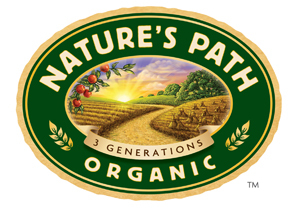 Flax'N Oats: Ingredients: Organic rolled oats, organic evaporated cane juice, organic flaxseeds, sea salt. Maple Nut: Ingredients: Organic rolled oats, organic evaporated cane juice, organic hazelnuts, natural maple flavor, sea salt. Multigrain Raisin Spice: Ingredients: Organic rolled oats, organic wheat flakes, organic evaporated cane juice, organic raisins (coated with organic expeller pressed canola oil), organic brown rice flour, organic corn meal, organic cinnamon, sea salt. Produced in a facility that uses peanuts, tree nuts & soy.